Mason Janvrin struck a blazing line drive that narrowly avoided the glove of General’s third baseman Jett Swetland and straddled the left field line. The fifth-inning single scored Zach Perdue for the first Mustang’s run of the game. Janvrin’s RBI single was all the offense St. Joe could muster on Friday night as it fell to the Ozark Generals 6-1. Following last night’s offensive explosion the Mustangs had a quiet night at the plate thanks to General’s starting Pitcher Derek Kennell. The night was not a total loss as the first 500 fans to the ballpark scored a Mustangs 10th Anniversary Color Changing Cup, courtesy of Hy-Vee. Trailing by four runs in the third, Mack Stephenson came on in relief and threw four-solid innings collecting six strikeouts while holding Ozark to just two runs. Fans took advantage of Friday Night Lights with $1 Miller Lite, Coors Lite, Bud Light, Busch Light; $2 drafts. Dawson Smith came on to close it out for the Mustangs in the seventh. Smith threw two-scoreless innings and recorded a strikeout. Brody Santilli went 2-3 with two singles. Malik Williams went 2-4 with two singles. Zach Purdue went 1-3 with a run scored. 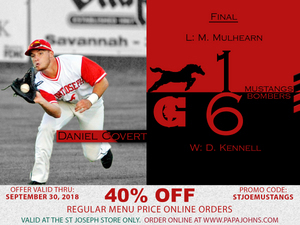 The Mustangs take two games from the Generals in the three-game series. St. Joe is 7-3 against Ozark in their last ten games. The Mustangs will be back at Phil Welch 7 p.m. Friday for a matchup against the Nevada Griffons (6-9). Be one of the first 500 fans to the ballpark and walk home with a Mustangs 10th Anniversary Baseball Giveaway, courtesy of Herzog. Come dressed in your black and gold as the Mustangs celebrate Mizzou Night. Stay in your seats after the game and enjoy the Mosaic Life Care Fireworks Spectacular.